The Hot Tub Cover Cap protects your spa or hot tub cover from harsh weather conditions. The Hot Tub Cover Cap protects your spa or hot tub cover from harsh weather conditions. Whether it’s ice, snow, wind or debris the elements can damage your hot tub cover and hot tub. The spa cover cap has been made to reduce that damage and give you a line of defence to the harsh weather. The Cover Cap is made from a tough and durable woven polyethylene. The spa cover cap comes in standard sizes of 7′ and 8′ square accommodating most hot tubs and spas in the market today. 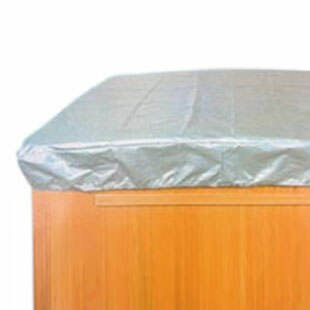 The 12″ skirt with elastic hem will keep the cover cap secure on your hot tub or spa cover. We can also supply round cover caps, special sized covers caps. Please email info@thecoverguy.com for more information about special sizing and price.